An informal school was held at the Cedar Log House from 1855 to 1860. John and Caroline moved south of Elberta to Greenwood Lane, which is the stretch of road extending from Grace Road/M22 to Lake Michigan. The Cedar Log House became the Cedar Log School in 1860 and Mr. B.W. Perry taught the classes. The Greenwood family relocated to their farm by Lake Michigan which included a big red barn that was visible by sailors on the lake, and it frequently was used as a navigational aid. Shipwrecked crew members received aid and refuge in the Greenwood home. John and Caroline Greenwood contributed greatly to the development of the Elberta area, yet I am not in favor of adding the proposed signs along our roadways. Why? 1- My first argument is ideological. Renaming roads and placing signs honoring individuals doesn’t fit the image of the Village of Elberta. The town is known for the Iron Works, the railroad and the car ferries. These undertakings created and supported a blue collar and everyman image for the town that refreshingly contrasted the religious and business interests which developed the other regions of the county. Streets are named after important people within the village. Most are named after generals or governors that were popular in 1866 when the village was platted. The street names have remained the same since some street names were changed to honor a number of servicemen who died during World War II. Naming streets after individuals contrasts with the identity of the village. Furnace Avenue is an apt title for old M168. It draws attention to the fact that a large and regionally important iron furnace was located there. It pays attention to the impact the Iron Works had on the development of the county. It also pays tribute to the diverse group of immigrants who worked the long days to keep the furnace profitable and successful for more than a decade. 2- John and Caroline Greenwood were not the first settlers of the area. Joseph Oliver had lived around Lake Aux Bec Scies (now known as Lake Betsie) for ten to fifteen years prior to the arrival of the Greenwood family. There is already a memorial in Gilmore Township Cemetery honoring Joseph Oliver as the first settler of the area. The Cedar Log Home was the first documented dwelling in Elberta, but I wouldn’t consider the Greenwood family as the first permanent settlers of Elberta. Residences were temporary and fitted the needs of families who lived off the land. The Greenwoods were less than permanent residents of Elberta. Although John Greenwood maintained a blacksmith shop in the village, the family resided in town for a total of five years. 3- The Greenwood’s Cedar Log House wasn’t the most important building at the corner of Furnace and Sherman. The American House Hotel was built in 1887 after the Greenwood edifice burned in 1885. The hotel also served as the township library and election hall, and the building was used for public meetings until the 1940s. The American House was torn down in 1972 after unsuccessful preservation efforts. So my counter proposal is this: Leave Elberta’s signs as they were. The signs would not be factually accurate and they would detract from the character of the town. I obtained the facts and dates for this piece from Blacklock’s History of Elberta and Sivert Glarum’s Our Land and Lakes. Both books, and many other books on the history of Elberta and Benzie County, are available to be checked out at Benzie Shores District Library. Andy Bolander moved to the Village in June 2014 and volunteers at the Benzie Area Historical Museum and other area organizations. If you have an idea for a story in this series on the amazing careers of your fellow Elbertians past and present, let us know at elberta.alert@gmail.com. My father, Earl Moyna, the Elberta rural-route mail carrier from 1920 to 1953, being a civil-service employee, was subject to legal restrictions on other work or positions he could occupy. For example, he could not run for elected office, local or otherwise, but could accept an appointed office—he was a school board member and president for some years. He also could not accept part-time employment with any business that might reflect on or interfere with his federal service. However, he was free to be self-employed with virtually no restriction. Since he had some spare time and was always looking to improve the quality of life of his large family, he continually sought ways to bring in a few more dollars to that end. He owned three city blocks in Elberta,* all undeveloped except for the one lot on which the house sat, at 826 Frankfort Avenue (now home to Margaret Davidhizar and Sylvester Lee). So he built a barn and a garage with a shop and farmed, using part for a large vegetable garden and the rest for pasture for the cows, pigs, chickens and horses he kept for meat, milk, eggs, and to work the land. Pa was used to working hard from the time his father died when he was not yet four years old. In Elberta his day began at 4 AM with tending the livestock and milking, helped by the boys and even by the girls. At 7:30 he was off to the post office to sort and “put up” the mail for the route in Gilmore, Blaine, and Joyfield townships. By 9 he was on his way around the route. In the early days, it would take 8 hours, but as time went on, improved roads and vehicles trimmed his time to about 4 hours; he would finish his route, process outgoing mail, and be home by 1 PM. I made that trip with him every work day that I wasn’t in school from the time I was 3 years old (Ma’s idea of day care). Most every family in Elberta struggled during the Great Depression and sought ways to help feed their families. We were no exception, though we had it a bit better than more than a few neighbors. Thanks to his tireless effort to improve his lot, Pa provided us with most essentials of life. Both he and Ma had hard childhoods and agreed that it was important to help their neighbor any way they could. Pa being busy about 18 hours a day, Ma took up the humanitarian tasks, assisted by the girls, while the boys helped Pa farm. Ma had her own version of a soup kitchen, making a canning cooker full of soup every week or as needed and feeding a number of neighborhood children who my oldest brother (“St.” Michael, who was called Floyd, his middle name, in his youth) would bring home with him from school. Ma’s kindness was remembered by those kids long after they were grown, and was repaid a hundredfold in later years when Ma was widowed and Mike was confined to a wheelchair. With all Pa had on his plate, you’d think he’d be content to spend what free time he had relaxing. But it wasn’t in his nature. When he wasn’t at a stock auction or an estate sale, he was pursuing other enterprises. In 1939, he started “Moyna Resort” on Heron Lake, also commonly called “Upper Herring Lake,” so the growing kids would have employment to start making college money (all seven of them attended college). He and the older boys and girls built the boathouse, the cottages, and the boats. Once open, Ma and the girls ran the business while the boys got jobs in the community. This allowed Pa more time to pursue another of his vast array of talents. From early on, Earl had possessed a knack for sharpening tools, something that to this day is a hard skill to master. He learned many such skills from his grandfather and namesake, Michael Earl Conboy, and brother, “Uncle Pete” Conboy, both Irish carpenters and tinkers. Earl set up his shop to sharpen all his edged tools (saws, axes, chisels, knives, scythes, sickles and sicklebar teeth, the triangular cutters used in cutting hay). He did every type of saw from handsaw to one- and two-man crosscuts, to circular-saw blades. He dressed, set and sharpened or filed every conceivable cutting device right down to sewing scissors. This was the substance of the Irish tinker’s art! One reason Pa sharpened his own tools was that he couldn’t find a reliable person to do it anywhere in the surrounding area of Benzie, Manistee, Wexford, Grand Traverse or Leelanau Counties. As word got out, Earl became increasingly busy at his craft. He charged a reasonable fee for this indispensable service and soon had customers from as far away as 50 miles bringing him their implements. I spent many a pleasant afternoon in the garage with Pa, holding the big saw blades steady while he hand-set them with a special hammer and handheld saw set. Handsaws he set with a pliers-like device that had a pre-set rake. Filing of the teeth was accomplished freehand on the big saws and with a mechanical filing device in a filing vice for the small-toothed saws. *The house was in block 26, lying between Charles and Fifth Street and facing M-22 (Frankfort Avenue), directly across the street from the Weksler and Doc La Rue homes. Block 27, a riparian block, was directly behind (east of) block 26. A riparian block was one which bordered an uncontained waterway, so how much land you owned depended upon where the water line was today. The third block, 36, was also riparian and used as summer pasture. It was between Third and Fourth Street. Some of those streets were renamed after WWII. Pat Moyna, the youngest of the nine children of Michael “Earl” and Margaret “Fern” (O’Leary) Moyna was born around 4:00 in the morning, during a late winter blizzard on Friday, the 10th of March 1939, under the supervision of the legendary town doctor, Frank J. La Rue and and his wonderful helpmate and wife, University of Michigan graduate nurse Ellen Baver La Rue. He was delivered by Ellen in the house that still stands at 826 Frankfort Avenue, directly across the street from the Crane-built Victorian which served as the La Rue family home as well as doctor’s office and clinic. Pat grew up in Elberta and as the youngest, became the memory of all his family, incorporating their adventures and memories into his own. Pat left Elberta after college and eventually had a career of over 28 years in the US Army Security Agency, where he was a signal intelligence and electronic warfare technician. With all the school teachers and English majors in the family, and being Irish, he was bound to gravitate toward storytelling and writing. Now retired finally at 74, he finds more time to focus on the prose and poetry he loves so much. The romantic past of what will always be his home town is a frequent subject of his efforts. 1946: On the front walk looking across the street at the Weksler House on the left and the gazebo of the La Rue house on the right. Both properties were owned and built by the Crane family, who owned several of the mills in town. The boys mugging the camera are (front to back) Bill Moyna, who had recently returned from service as a glider infantryman in the 13th Airborne Division in France. Bill returned to service during the Korean Conflict as a career Air Force officer. Next to Bill is brother Gene, a remarkable youth who overcame incredible odds to become an elementary teacher and principal after his service, also in the Air Force, during the Korean War. Behind Gene is his best friend, Doctor Kenny Bishop, middle son of dear family friends (grocer) Gene and Lila Bishop. Winter of 1945: My Sister Earlene in front of Earl’s 1941 Chevy. A good view of the house at 826 Frankfort Ave. Tourists often stopped to ask about the “unusual roof.” Not obvious in this photo was that the gable ends of the roof were cut off or “hipped” by a Swiss carpenter named John Weiss whom Earl hired to re-roof the place while Pa and Ma visited his mother in Detroit. Pa asked him why he did that and John said, “So it would look right.” He explained that all the houses where he came from in the Alps were built like that, to reduce snow and ice damage in winter. Ma was furious until tourists started stopping to comment on how unique and stylish it looked. Margaret Davidhizar, who lives there now, painted it black and had the gable ends restored. Easter weekend, 1951: The first granddaughter of Earl and Fern Moyna, Don & Madelyn (Moyna) Hosek’s little girl, 3-year-old Chris helps her grandfather Earl dig the barn and shop out of a freakish late winter blizzard on Good Friday. Nearly two feet of snow fell in less than 12 hours over night. The buried shop and barn are obscured by the drifts and the bank plowed up by Village employee, Ed Berryhill. 1945 or ’46: A good look at the front entrance to the house. That’s me, Pat, resting on my laurels (and on the gate post) after shoveling off the walk. A very awesome Reflections by the Bay tomorrow: Shipwrecks of Sleeping Bear Dunes! a talk by Ross Richardson, who should know. 7 pm at Benzie Shores District Library. Explore a treasure trove of history without having to squeeze into a diving suit. For Memorial Day, the Alert reflects on the sacrifice of Elbertians living and dead who have dedicated themselves to our national security and fought to uphold our freedoms. 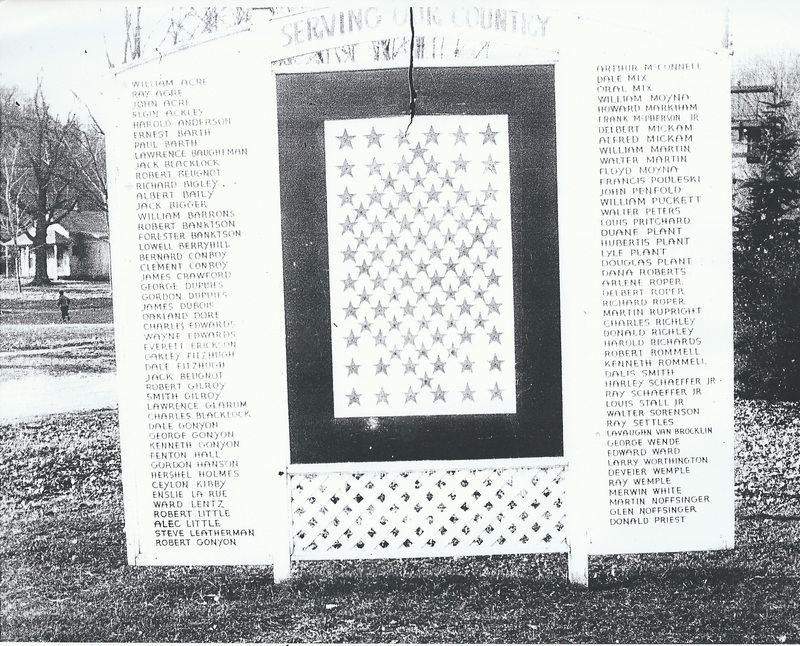 Below is the only known image of the monument that once stood in Veterans’ Park. Parks and Rec is currently at work on a plan to create a new memorial. If you would like to add a name, donate funds, or help out in any way, please contact Arthur Melendez at 616-446-5340. Art is the author of a beautiful piece on our living vets for the May issue, which will be distributed on Tuesday. The monument that once stood in Veterans' Park. Foghorn: Monument to Edison Berryhill! There really ought to be a monument to Mr. Berryhill, who was our department of public works person for many years. He collected garbage twice a week and took it to the old landfill out at the end of Zimmerman Road. He plowed all the roads and the sidewalks. He was tireless and did almost all the work by himself. He just had an extraordinary amount of energy—when he was on leave from the Village during the summer, he would work at the Cherry Factory that used to be next to the Cabbage Shed. He was in charge of grading all the roads, which were all gravel back then, and he did it with a big machine that made a terrifying racket. He did a wonderful amount of work for the Village and nothing’s dedicated to him, and there should be.